NovaStor’s new eLearning and certification program provides IT-resellers with the technical knowledge, product positioning, and tools for maximizing sales growth of data protection products. Data protection specialist NovaStor introduces an eLearning and certification program for resellers in EMEA and the USA. The program is designed to reinforce NovaStor’s partner support in both regions and provide resellers with the technical know-how and convincing sales arguments for increasing revenue with NovaStor’s SMB backup software products. By successfully passing the test following the online training, resellers qualify as certified ValueCREATE! Partners and benefit from the numerous advantages included with NovaStor’s ValueCREATE! partner program. Although relatively new, in Germany alone, over one hundred IT-resellers have completed NovaStor’s local partner training and are realizing the benefits. With the new eLearning module, resellers in EMEA and the US now also have the opportunity to learn from NovaStor’s backup and restore expert knowledge. The clear and concise training focusses on best practice recommendations for backup and restore using NovaBACKUP SMB products for PCs and servers with Microsoft SQL and Exchange and virtual machines (Hyper-V / VMware). The course also provides valuable technical information and supporting material for sales managers and representatives, backup administrators and product managers. 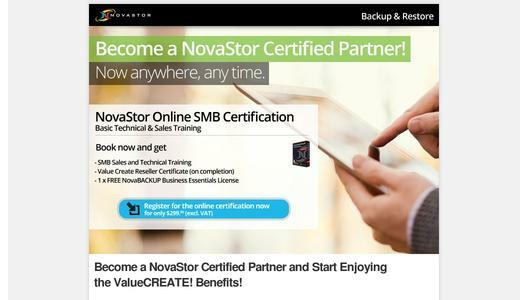 With successful participation and completion of training, resellers obtain the status as NovaStor Certified Partner and receive one free NovaBACKUP Business Essentials license for server backup including Microsoft SQL, Exchange and virtual machine (Hyper-V/VMware) protection. NovaStor’s certified partners benefit from personal assistance, attractive margins, regular webinars on current topics, lead generation, marketing support and more. NovaStor’s strategy focusses on a powerful reseller network to achieve the highest levels of customer satisfaction. As part of NovaStor’s partner program ValueCREATE!, NovaStor Certified Partners benefit from unlimited support from NovaStor’s highly qualified technical engineers either in California, USA or Hamburg, Germany. NovaStor support teams assist resellers by phone, e-mail, and even by connecting to customer systems remotely when necessary. "Backup projects are a matter of trust. That’s why we are particularly pleased that resellers choose NovaStor as an alternative to other international software vendors that do not provide the same level of personal technical support”, comments Stefan Utzinger, NovaStor CEO. “In the reseller community we score high marks with our stable products, local presence and quick management decisions as well as enabling resellers to manage all their installations with central remote management." To speak with NovaStor’s team personally and to hear about product news, visit NovaStor's website at www.novastor.com/cebit2013 for submitting a free ticket request, and to book your personalized presentation.